NO ONE WAS AROUND AS PHEME SNEAKED down the hallway of the girls’ dorm on the fourth floor of Mount Olympus Academy. She knocked on a door. “Anybody home?” she called out softly. As usual her words puffed from her orange-glossed lips. They rose above her head in little cloud-letters before floating away. Since she was the goddess of gossip and rumor, this was a useful gift. Any newsy tidbits she spoke when others were around were guaranteed to spread swiftly throughout the Academy. Pheme waited a few seconds outside the door, listening for a reply. She wasn’t surprised when she didn’t get one. It was lunchtime. Most students were in the cafeteria. Perfect. She turned the doorknob. It gave easily. Most girls at MOA didn’t bother to lock their doors. Quietly she slipped into the room—Artemis’s room. Along with Athena, Aphrodite, and Persephone, Artemis was one of the four most popular goddessgirls in the whole school. She was also one of a handful of girls who didn’t have a roommate. First thing, Pheme opened Artemis’s closet. A mess as usual. Sports equipment and old school projects lay in a heap at the bottom. Rumpled chitons hung half on and half off the hangers. Artemis didn’t care much about neatness or clothes. Of course, none of this surprised Pheme. She’d snooped in here before. It was her job—sort of. Earlier in the year Principal Zeus had made her floor monitor for the girls’ dorm. And that meant she was responsible for doing weekly safety checks. Zeus had never been especially clear about how she was to carry out the checks. Or even what kind of hazards she should watch for. So she’d decided all that for herself. And her methods included room-snooping. As she peeked into a random box inside the closet, her stomach growled with hunger. Normally she’d be at lunch too. But today was Thursday. And although none of the other girls knew it, every Thursday she skipped lunch to make the rounds of their dorm rooms. To look for hazards. And if she came across some gossip-worthy information too—well, that was just the ambrosia frosting on the cake! She fished out a snack bar from her chiton pocket, then munched on it as she began sorting through the stuff on the closet floor. Her hand brushed against a broken wooden arrow. Here was a definite safety hazard. You could get a sliver from the split shaft. Or cut yourself on the sharp arrow tip. Pheme stuck the two halves of the broken arrow into the trash can by Artemis’s desk. With all the mess in here, Artemis probably wouldn’t even notice. She had no idea it was her turn for an inspection today. Next Thursday would be Athena and Pandora’s turn. Of course, it wasn’t just physical objects—like broken arrows—that could pose safety hazards. Sometimes students did things that were dangerous. Like flying off to who knew where without first getting Zeus’s permission. If Pheme uncovered such plans, it would be her duty to let Zeus know. She smoothed out some crumpled papers she found in the trash and looked them over. Old math assignments. Nothing interesting. She tossed them in the trash again and headed back to the closet. Today Pheme was really hoping to find more than broken arrows and other commonplace safety hazards. She needed to uncover some hugely hazardous information that Zeus absolutely needed to know. Something so mega-important that when she reported it to him, she’d win back his support and trust. Because right now—just when she needed him to have confidence in her reporting abilities more than ever—Zeus had lost faith in her. Simply because she’d gotten it wrong about who’d stolen the Norse goddess Freya’s necklace during the girls’ recent Olympic Games. Honestly, anyone could have made that same mistake. But try telling Principal Zeus that. He could be really unreasonable at times! Pheme absentmindedly hung up a couple of Artemis’s chitons before she realized what she was doing. Artemis would likely overlook a broken arrow in her trash. But for the most part things had to look undisturbed. She threw the clothes back onto the floor. Then she tugged over a step stool and started digging around on the shelf above the clothing rod. Regaining Zeus’s support right away was critical. Until she could get back on his good side, he was unlikely to write her a glowing letter of recommendation. Which was something she needed to complete her application to Teen Scrollazine. She just had to get the student staff reporter job that had opened up last week. Writing for Teen Scrollazine was her dream! Just imagine how it would impress her fellow students at MOA if she were in charge of covering important news stories. Finally she’d get some respect. “Whoa!” Something was staring at her from a dark corner of the shelf! Startled, she nearly fell off the stool. Was that a—a head? Wait. No. It was only an old Beauty-ology class project. The head form wore frightful makeup and a tangled wig. Pheme remembered doing the same project back in fourth grade too. Only, as she recalled, her head form had turned out much better. Makeup and hair styling had never been Artemis’s thing. At the sound of howling out in the hall, Pheme froze. Dogs? There was only one girl in the MOA dorm that had dogs. Ye gods! Artemis was coming! Panicking, Pheme kicked the stool away and leaped into the closet to hide. She made it only seconds before Artemis and her three hounds came into the room. The dogs made a beeline for the closet. She held her breath as they sniffed and scratched at the closet door. Were they after her, or the last half of her snack bar? Her stomach growled again. Would Artemis hear? The door to the hall opened and closed again. And then Artemis was gone. Phew! After waiting a minute Pheme popped out of the closet. The dogs jumped and wiggled, acting happy to see her. Not at all the reception Artemis would’ve given her if she’d caught her nosing around. Most girls, Pheme knew, would likely disapprove of her room-snooping. If they ever found out, they’d probably get all mad and say she was taking her monitor job far too seriously. However, she got results! She’d uncovered and removed many safety hazards during her weekly dorm checks. Why, she’d probably even saved lives! Still feeling a bit rattled from nearly being discovered, Pheme slipped out of the room. No way could she snoop effectively with those dogs hounding her the whole time. No problem. She could finish going through Artemis’s room next Thursday. Today she’d trade for Athena and Pandora’s room instead. After moving farther down the hall, she paused outside their door. She called out to check that neither of them was inside. Then she carefully looked both ways. The coast was clear. She darted inside, then closed the door soundlessly behind her. Her eyes scanned the room for anything of interest. Anything mega-hazardous that she could report. Unfortunately, everything seemed pretty much as usual. As she passed Pandora’s unmade bed, she noted the jumbled-up bedspread. The curious girl’s pj’s, which were covered with a pattern of question marks, lay in a heap on top of it. She and Artemis had messiness in common. Athena’s bed, by contrast, was neatly made. Her blue and yellow dotted bedspread hung evenly and without wrinkles. Like in all the girls’ dorm rooms at MOA, the beds were on either side of the room. (Artemis’s dogs slept on her extra bed!) Beyond the beds were identical closets and built-in desks. The boys’ rooms on the fifth floor were rumored to have the same setup. Pheme didn’t know that for sure, because she’d never snooped in them. Except for the occasional party in the common room at the end of the boys’ hall, girls weren’t allowed up there. If a rule was clearly stated like that, Pheme tried to follow it. She was nosy, but she wasn’t a criminal! Before she’d begun room-snooping, she’d even checked the Goddessgirl Guide, to be sure there wasn’t a rule against entering an empty, unlocked room. There wasn’t. Probably because no one but her had ever thought of doing it! Stopping by Pandora’s desk, Pheme bent to examine an article from the Greekly Weekly News that was tacked to Pandora’s bulletin board. POSEIDON WATER WAVES OPENS TO THE PUBLIC TODAY, read the headline. The accompanying photo showed a cute godboy named Poseidon grinning big. He had designed the magnificent water park. Behind him you could see gracefully curving slides made of polished marble, gleaming fountains, and pools of turquoise water. The water park had opened way earlier in the year, just after Athena had first come to MOA. Back then Pandora had been crushing on Poseidon. But now she liked a Titan godboy named Epimetheus. Not only was this article unworthy of reporting to Zeus, it was also old news. And nobody cared about old news. She needed new news! Pheme moved on to Athena’s side of the room. There was a tall stack of textscrolls piled neatly on her desk. Which could only be considered a safety hazard if they happened to topple over and fall on you, she thought wryly. Godness, that girl read a lot! But that wasn’t news. Pheme pictured herself announcing it in the cafeteria. Guess what, everyone! Athena reads a lot! She could imagine the giant yawn that would spread over the entire room. Everyone would probably just take a nap. They already knew Athena was a brain and a half. The smartest girl at MOA, in fact. No, not news at all. A surge of panic flowed through her as it always did when she worried others might find her uninteresting. It was way more fun when they hung on her every word! Glancing out the window, she noticed that the sundial read ten to one. Not much time left. “Come on, come on. There must be something exciting around here,” she murmured. Her brown eyes darted back to Athena’s stack of scrolls. She scanned the titles. Besides the usual required class scrolls, there were several that Athena had checked out of the library, including Invention and Innovation and A Concise History of Greek Inventors and Inventions That Changed the World. There was probably a whole chapter on Athena in the second scroll, thought Pheme. Athena had invented tons of useful things, including olive trees, flutes, farm plows, ships, and the modern chariot. Principal Zeus must be very proud of his brainy daughter, she thought wistfully. Although he could be really stern and intimidating, Pheme totally respected him. And the praise he bestowed on her whenever she brought him a piece of particularly useful information was something that made her feel more . . . worthy. Growing up at home, she’d rarely gotten enough of that kind of positive attention. Her gaze drifted over a pile of papers beside Athena’s textscrolls. Several seemed to be sketches for new inventions. There were also scraps of papyrus with weird mathematical symbols and numbers scribbled on them. Borrr-ing! Wait! What is this? Grinning, Pheme pulled out a notescroll with a row of Xs and Os across the bottom. These were no mathematical scribblings. This was a note from Heracles, Athena’s crush. How sweet! Still—not news. And not a safety hazard, either. Starting to feel desperate, Pheme slid open Athena’s desk drawer. Her entire face lit up when she saw what was inside. Athena’s diaryscroll! This was infinitely more interesting than any old safety hazard. “Where have you been all my life?” Pheme asked it, giving the diaryscroll a quick kiss as she pulled it out. She’d never run across it while snooping in here before. Athena must have been keeping it in a hiding place but forgotten to put it back. There wasn’t even a magical locking ribbon tying it shut. Pheme slipped into Athena’s chair and set the diaryscroll on the desktop, careful not to disturb anything else. Then she unrolled it little by little. Her sharp eyes searched eagerly for something juicy. Most of the entries were dull accounts of homework assignments needing to be done or homework already completed. Blah, blah, blah. Snooping on Athena was a bit tricky. She was Zeus’s daughter, after all. But if Pheme found out she was in trouble with her schoolwork or at odds with another student, he’d likely be grateful to know. However, since Athena was pretty much perfect, what were the chances of that? “What are you doing!” a voice shouted. Startled, Pheme leaped up, nearly having a heart attack. But then she relaxed, realizing she hadn’t been discovered. The shout had come from outside. She peeked out the window and saw that Hermes’ silver-winged delivery chariot had touched down in the courtyard below. He’d only been scolding a student for getting in the way as he’d landed. The back of his chariot was piled high with packages, including some deliveries for MOA. She watched Hermes hop out and heft a load. When he started toward the Academy’s front doors, Pheme caught a small movement among the packages he’d left behind in the chariot. Was that a—a hand popping out? She blinked. When she looked again, it was gone. She squinted at the chariot, long and hard, but the hand didn’t reappear. She must have been seeing things, she thought, rubbing her eyes. And she was also wasting time. She plopped into Athena’s chair again. Back to business. She unrolled more of the diaryscroll. And then gasped. Because almost immediately a word jumped out at her. It was her own name! The entry was dated recently, during the girls’ first Olympic Games. It read: I’m so mad! Pheme told Dad that Aphrodite and Persephone stole Freya’s necklace. Of course it was absolutely untrue. “Ye gods, cut me some slack, can’t you?” Pheme whispered. Her cheeks burned anew with embarrassment. This was the very incident she was hoping to erase from everyone’s minds—especially Zeus’s—by reporting something else really big and newsworthy. When Freya’s fabulous jeweled necklace had disappeared during the Girls’ Olympic Games, Pheme had glimpsed Aphrodite and Persephone holding something sparkly. Naturally she’d assumed it was the necklace. But it had turned out to be a jeweled collar for Adonis, the kitten they shared. Not Freya’s necklace. Hey, she didn’t claim to be perfect. She was the goddess of gossip and rumor, not the goddess of thoroughly fact-checked information. 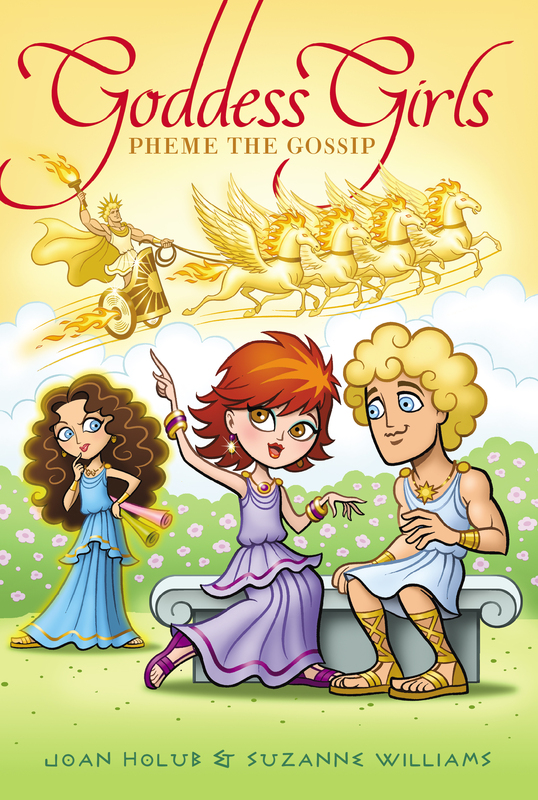 Some people, Principal Zeus included, didn’t seem to realize that gossip wasn’t, and never would be, an exact science. It was more of an art, really. And she was a master at it—most of the time, anyway! After the necklace incident Zeus had called her into his office and ranted at her. His disappointment in her had really hurt. She’d had to bite her lip to keep from crying. She knew he valued her ability to uncover important information. That was the very reason he’d invited her to MOA years ago. She could still remember when her parents had given her the good news. For once she’d felt appreciated. Like she stood out. Being in a family of thirteen kids, it wasn’t a feeling she was used to. She’d nodded, but in truth it was hard to always figure out which pieces of information were worthy of his attention. What if she failed to report something he really needed to know? That could be disastrous! So she’d kept right on room-snooping. Just in case. Pheme glanced down at the diaryscroll again. She was almost afraid to read any more, in case the words were hurtful ones. Turned out they kind of were. I avoid Pheme as much as possible, Athena had written. Honestly, that girl couldn’t keep a secret if her life depended on it. Today she told Heracles that I said he treats his favorite knobby club like it’s a beloved pet. And I did say that, but not to her. She must’ve overheard me. She shouldn’t go blabbing words said in private. What a snoop! I mean, I wouldn’t even put it past her to sneak into my room and try to read you, diaryscroll! Huh? Startled by the accuracy of Athena’s words, Pheme breathlessly unrolled more of the diary. She read on. Well, Pheme, if you or anyone else does read this, you’ll be sorry. Because I put a magic spell on it. A magic spell? Pheme’s eyes bugged out. She looked around, wondering if there was a booby trap nearby ready to spring. She didn’t see anything. But she did feel something. Her fingertips were starting to tingle. They were turning pink! They went even pinker, before darkening to red. Startled, she let go of the diaryscroll. It shut with a snap, and she rammed it back into Athena’s desk drawer. Then she jumped up and just stood there staring at her hands in horror as the red spread. It zipped along her fingers, past her knuckles, and all the way up to her wrists, where it finally stopped. Aghhh! Both of her hands looked like she’d dipped them in bright red paint. Athena’s spell had worked. Pheme had been caught red-handed!